Says Travis County Sheriff Sally Hernandez "declared that she would not detain known criminals accused of violent crimes." By W. Gardner Selby on Thursday, May 18th, 2017 at 4:20 p.m.
Gov. 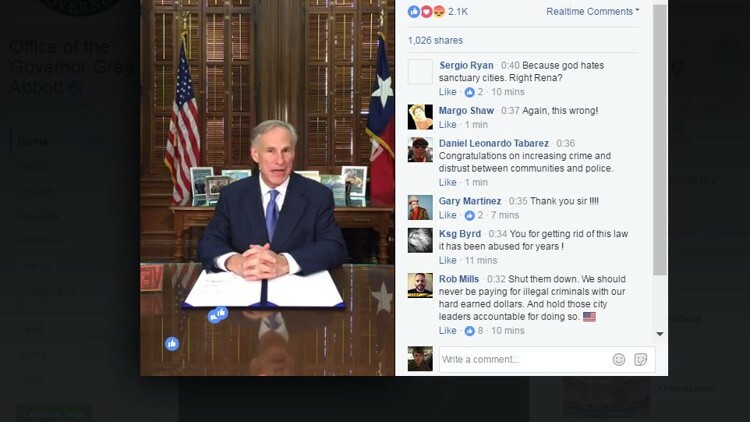 Greg Abbott made a claim about Travis County's sheriff as he prepared to sign Senate Bill 4 into law during a Facebook Live presentation May 7, 2017 (screenshot). Greg Abbott gave a backhanded howdy (or the back of his hand) to a Democratic sheriff in May 2017 before he approved the Republican-driven proposal intended to keep local communities from shielding unauthorized immigrants from deportation. The governor explained his support of Senate Bill 4 during what may have been the planet's first exclusively Facebook Live signing of legislation into law: "This law cracks down on policies like the Travis County sheriff who declared that she would not detain known criminals accused of violent crimes. Those policies are sanctuary city policies and won’t be tolerated in Texas. Elected officials and law enforcement agencies, they don’t get to pick and choose which laws they will obey." Three days earlier, the referenced sheriff, Sally Hernandez, issued a statement suggesting that while SB 4 wouldn’t enhance public safety, she'd go along: "While I hate seeing a state law like this come to pass," Hernandez said, "I have always followed the law and that will not change." 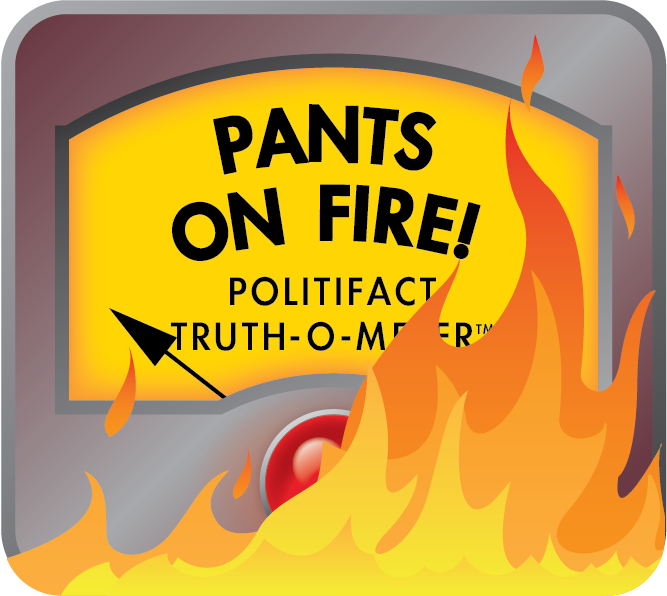 We previously found False an Abbott claim that Hernandez was refusing to enforce a federal law regarding communication about jailed immigrants. The sheriff's published policy declares otherwise. Still, did Hernandez declare that she wouldn’t detain known criminals accused of violent crimes, as Abbott said? We asked Abbott’s office for the basis of his fresher claim and didn’t hear back. You could read the governor to have said that Hernandez, who was sworn in as sheriff in January 2017, put in place rules against keeping convicts accused of violent crimes behind bars — a broad unsupported charge given that the county continues to prosecute crimes of all kinds. But in the context of Abbott's mention of "sanctuary city policies," he surely was referring to Hernandez’s announced policy, effective Feb. 1, 2017, that the county would no longer automatically grant requests by federal authorities to "detain" specified suspects for up to 48 hours so agents could investigate and possibly hasten deportation. Hernandez, in her January 2017 announcement of the policy, said the department would honor ICE detainer requests only if an inmate was charged with or convicted of capital murder, murder, aggravated sexual assault or human smuggling — or if federal agents obtained a court order or arrest warrant for a suspect. Otherwise, inmates would be able to post bail and be released, no matter their immigration status. Hernandez said before the policy took effect: "Our community is safer when people can report crimes without fear of deportation. I trust the court system and our judges to assess the risks and set appropriate bonds and conditions for all who are incarcerated." Let’s look at the wording of the policy, then gauge whether, as Abbott said, Hernandez was saying she wouldn’t detain known criminals charged with violent acts. The policy states the sheriff’s office "shall comply with ICE detainer requests under the following circumstances: (a) when the detainer request is accompanied by a judicial warrant or court order for continued detention or notification, to the extent required by the judicial warrant or court order; or (b) when the individual who is the subject of the ICE detainer is charged with or has been convicted of the following felonies under Texas law: (1) Capital Murder, Tex. Penal Code Sec. 19.03; (2) Murder -- First Degree, Tex. Penal Code Sec. 19.02; (3) Aggravated Sexual Assault, Tex. Penal Code Sec. 22.021, and (4) Continuous Smuggling of Persons, Tex. Penal Code Sec. 20.06." Separately, we noticed, the policy leaves wiggle room for the sheriff to hold inmates facing other charges. A portion states the office "reserves the right to exercise discretion in any individual case to ensure that justice is served." When we asked the sheriff’s office about Abbott’s claim, spokeswoman Kristen Dark said by email that no inmates placed in the Travis County Jail "will be released without making bond or having his or her charges disposed by a judge." Abbott’s description of the sheriff’s detainer policy, Dark wrote, wasn’t accurate because the policy provides for detainers to be granted automatically for several violent crimes and also gives the office discretion to "ensure that justice is served." Dark wrote: "In each and every case," the office’s "command staff reviews an inmate’s current charge/s as well as criminal history. If there is any indication of violence in that data, the ICE Detainer Request is honored," she said. We asked Dark if the agency had recently analyzed when jail personnel approved or rejected ICE detainer requests. In reply, Dark emailed us a spreadsheet, covering department decisions from March 1, 2017 through May 5, 2017, which she described as its May 5, 2017, response to an open-records request by KUT News. The sheet doesn’t show past convictions for any crimes, so we didn’t see a way to reach conclusions about individuals not being detained despite their criminal histories. But what about letting individuals go despite current violent-crime charges? Over the two-plus months, according to the sheet, ICE detainer requests were approved by the department for around 200 individuals charged with crimes, with many individuals listed as remaining in jail. Charges filed against the detainer-approved individuals include sexual abuse of a child; manslaughter; aggravated sexual assault; and driving while intoxicated, according to the sheet. The sheet identifies 15 individuals already released to ICE in response to detainer requests. Related charges include DWI; assault causing bodily injury; aggravated assault with a deadly weapon (two men); terroristic threat of a family member; manufacture of a controlled substance with the intent to deliver; possession of marijuana; burglary of a habitation; sexual indecency with a child; and aggravated sexual assault of a child. On the flip side, the sheet lists about 90 individuals mostly released by the county after detainer requests were denied. Many of the people were arrested for allegedly driving while intoxicated or possessing small amounts of marijuana, neither of which would necessarily signal a violent crime. We counted nine individuals among the 90 who were each arrested for an alleged assault causing bodily injury to a family member--domestic violence, Dark told us by phone. Eight of these inmates were released on personal recognizance bonds, the sheet states, after the sheriff declined to approve a detainer requested by ICE; the ninth was released by a judge’s order, the sheet says. We asked Dark about the rationale for declining detainers on those individuals. By email, Dark replied: "The nature of the behavior that resulted in the arrests was not aggravated and therefore, did not meet the threshold required for" the office to automatically "honor the ICE detainer request." Dark said by phone that further research revealed that five of the individuals had previously been released to ICE, possibly even deported. Dark’s email said: "If ICE has past experience with the individuals, they should know the status and be able to quickly get a warrant or court order. If presented with a warrant," the sheriff’s office "would gladly have turned these inmates over to ICE upon the disposition of their charges by a judge," Dark said. The sheet shows too that a man who allegedly made a terroristic threat was released on a personal recognizance bond after the sheriff denied a detainer request. Dark said by email the individual had allegedly told a security guard at a bar, "I’m going to shoot you." Dark said no weapon was found in his possession. Abbott said Hernandez "declared that she would not detain known criminals accused of violent crimes." That’s a distortion of Hernandez’s statements and her announced policy. The sheriff made it clear she wouldn’t automatically honor all requests to hold suspects for ICE. But the policy specifies several violent crimes for which the department directly grants the hold requests and it reserves the office’s right to exercise discretion in the interests of justice. Abbott, a seasoned judge and former state attorney general, should know better. We find this claim incorrect and ridiculous. Pants on Fire! Published: Thursday, May 18th, 2017 at 4:20 p.m.